The Lunar New Year is coming up on 31 January 2014 and this year is the year of the horse. The Lunar New Year is determined by the lunar calendar from the cycles of the moon, so the start of the new year falls on a different date every year, sometime between late January and early February in the western calendar. Therefore, a person born in January or early February may have the zodiac animal sign of the previous year (this means you are a year older too!). Most Asian countries have adopted the western calendar, but the lunar calendar is still often used for selecting an auspicious date for special occasions such as weddings, funerals or opening of a business. Certain holidays are also based on the lunar calendar, for example, the Chinese and Vietnamese celebrate the Mid-Autumn Festival which occurs on the 15th day of the eighth month in the lunar calendar, during a full moon, which is in late September or early October in the western calendar. During the Mid-Autumn festival, mooncakes are eaten. The Lunar New Year is the most important celebration for Asians. My family doesn’t really celebrate Christmas, we’ll get together and have a feast (this holiday is just another excuse to eat!) but it won’t be anything traditional, and I’ve never had a Christmas tree. Although the Lunar New Year would be the more appropriate and relevant name for this holiday, it is often just called Chinese New Year in cities, even though it’s celebrated by many others besides the Chinese – the Vietnamese, Japanese, Thai and Koreans etc. Maybe because China has a longer history and there are a greater number of Chinese living in cities that celebrate it, so their traditions tend to dominate. Regardless of the name, the celebration of the Lunar New Year in many Asian cultures is similar but each would also have their own specific traditions. Being Chinese Vietnamese (my grandparents are from China but my parents were born and grew up in Vietnam), I get the best of two worlds! The Chinese and Vietnamese have almost identical zodiac animal signs for their lunar calendar except that the Vietnamese have the water buffalo instead of the ox, the rabbit is replaced by the cat and goat rather than sheep. The Vietnamese New Year is called Tét. Tét is the abbreviation of Tét Nguyen Dan which means the ‘first morning of the first day’ of the new period. In Vietnamese language, to celebrate Tet is to “ăn Tét”, literally meaning “eat Tét”, where you will often get asked "will you eat Tết with your family?" or "where will you eat Tét this year?". So as you can imagine, food is an important part of the celebrations! 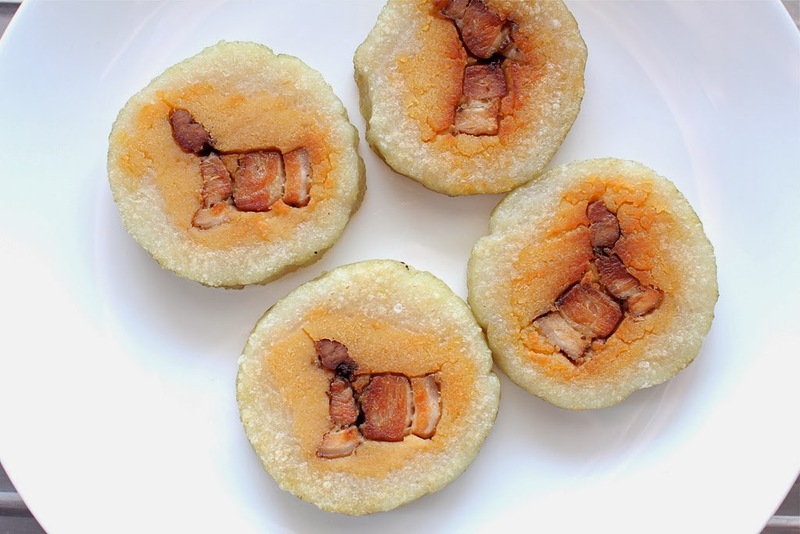 Bánh tét is a traditional Vietnamese sticky rice cake that is consumed during the Lunar New Year. You can buy it at Asian groceries but only in the lead up and during the Lunar New Year or you can make it at home. Bánh tét keeps for a long time, it can be kept at room temperate for a few days, then a week in the fridge or frozen for up to 3 months. This makes it perfect food for celebrating the New Year because it’s something you can prepare (or buy) in advance and it’s ready to eat, so you don’t have to worry about cooking and have more time to enjoy the company of family and friends. 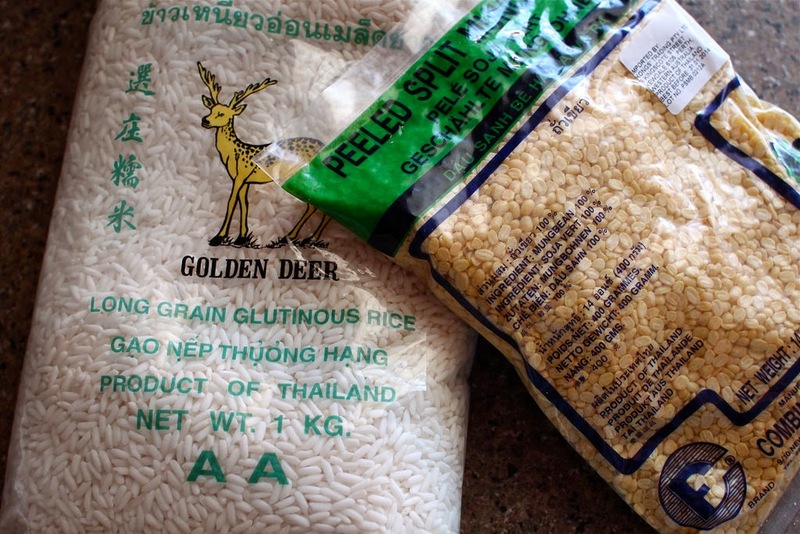 Its ability to keep well and portability also made bánh tét food that Vietnamese soldiers took to war as iron rations for a nutritional, sustaining one dish meal. I love eating bánh tét. I love how the sticky rice is perfumed with the flavour of banana leaves, and the filling of nutty mung beans and meaty fatty pork that has been marinated with fish sauce, pepper and a bit of sugar is a simple combination of ingredients that taste great together, especially sliced and fried until golden and crispy. Chewy and soft on the inside but crisp on the outside! What I also love about bánh tét is the story behind it. 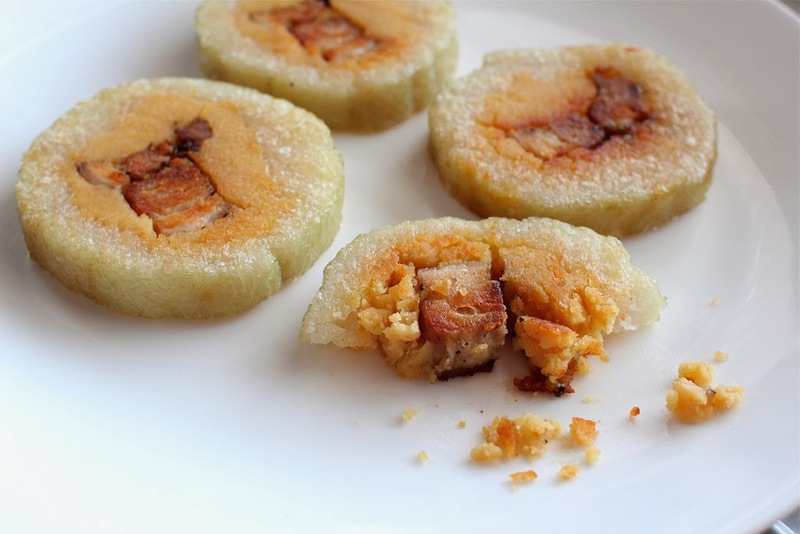 Bánh tét is the cylinder version of the square shaped sticky rice cake bánh chưng. Legend has it that around 3,000-4,000 years ago, when it was time for the sixth King Hùng Vương to choose his successor, he asked each of his 18 sons to prepare a dish worthy of offering to their ancestors. As the best dish would decide the next ruler, all the sons traveled far and wide to procure rare and luxury ingredients to make a fancy dish, except for the youngest and poorest son Lang Liêu. 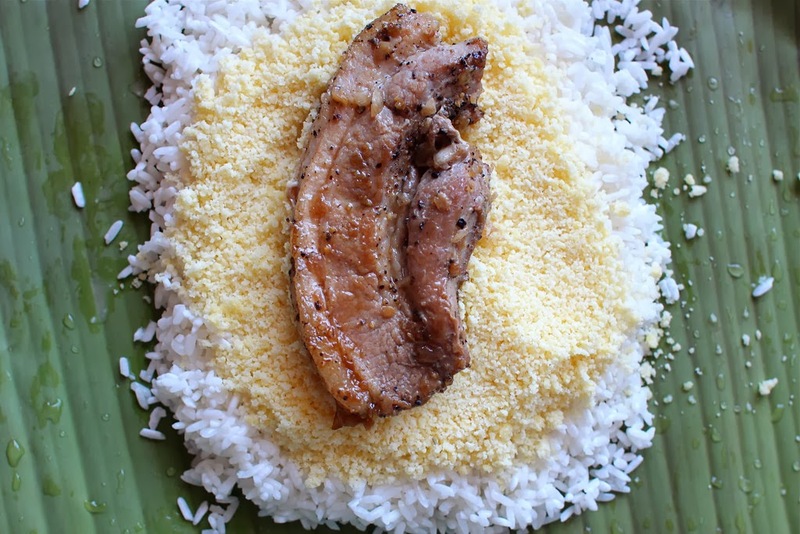 Inspired by a dream, Lang Liêu came up with a cake that contained the most humble of ingredients – rice from the nearby fields (something from the earth, an everyday staple), mung beans (representing the sun), and pork (another everyday ingredient), wrapped in leaves from the forest and cooked for hours. 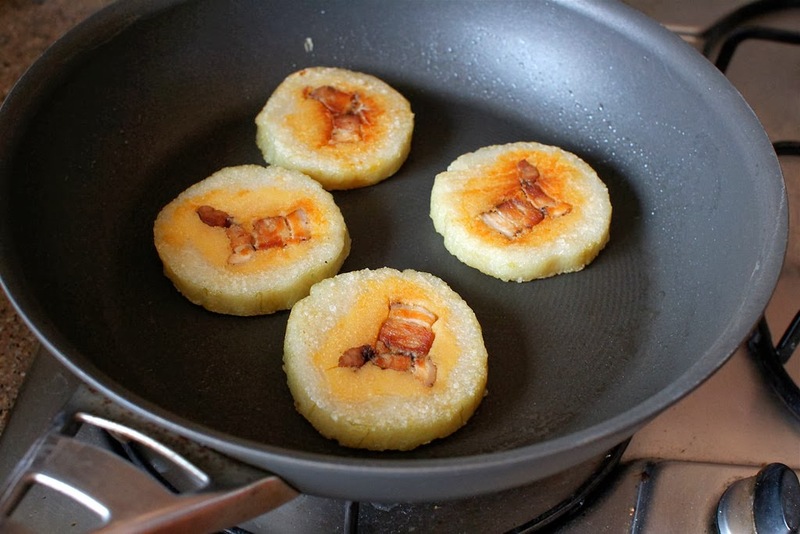 Although his offering weren't as extravangant as those of his brothers, Lang Liêu won his father's heart and the throne with these simple and meaningful delicious sticky rice cakes that anyone could make. 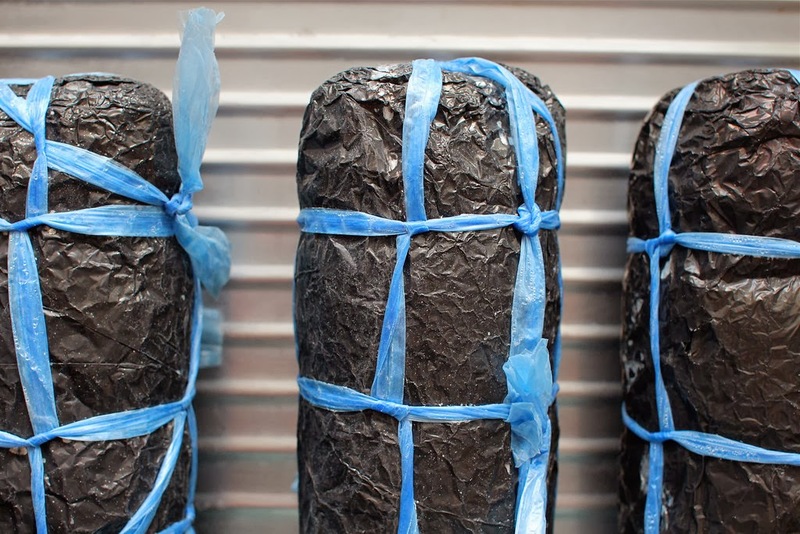 For thousands of years, the Vietnamese continue to make these sticky rice cakes. I love that this ancient method of cooking has been preserved and it maintains a central place at the family table, and is provided as an offering for the ancestor worship altar as a way of expressing gratitude. It has become a tradition to eat bánh tét during the New Year. Even though the New Year is filled with themes and messages of prosperity and abundance, with extravagant banquets and gifts, I love the fact that this dish feels contrary to all that - it presents something that is really humble and accessible to everyone as it is cheap and easy to make. 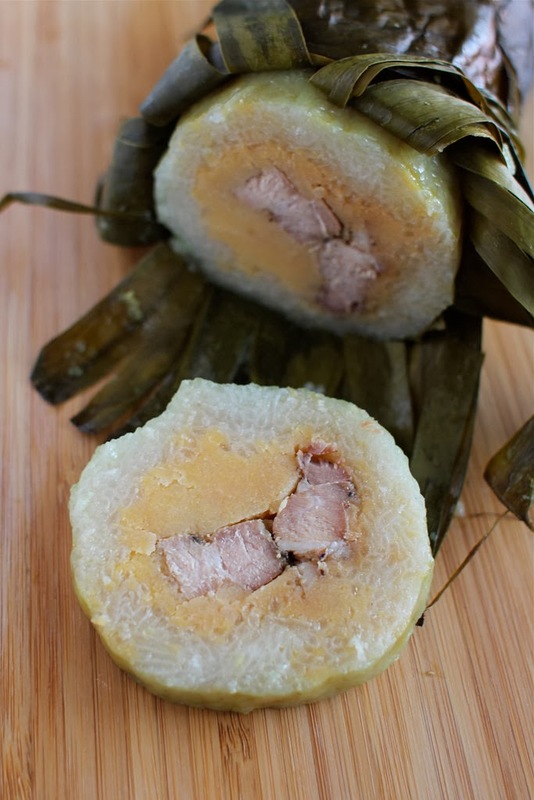 Bánh tét is prepared using just a few ingredients (rice, mung beans and pork), the method is simple once you get the hang of wrapping the filling in the banana leaves but takes a long time to cook, you need to set aside about 8-10 hours. Traditionally, families came together before the new year to make bánh tét as it is time consuming and each member of the family would help out with different tasks, as well as take turns keeping watch over the boiling pot as the packages cook for hours, replenishing with water as needed. Each package would be made together with a lot of love and care. These days, something so time consuming is made less and less in families who opt to buy it from the shops instead. It also feels crazy sometimes when you think about how long a dish can take to make and then it’s consumed in an instant. It makes you wonder if it was worth the time. I had spent almost 2 hours wrapping the bánh tét as it took me a while to get the hang of the technique and I also had to go out and buy proper string. I started off using butchers string that I had at home but I couldn’t get it tight enough around the package, so I went out and bought the type of string that is usually used for wrapping these cakes - raffia string which has a plastic texture. Then I watched over it for 7 hours boiling away in a pot, rotating the parcels every now and then to make sure that they were cooking evenly, and regularly replenishing the water in the pot as it boiled away. The end product doesn’t seem to amount to much in the big scheme of things - like I must have better and more important things to do with 9 hours of my time? !…but the thought and time that you put into making something is the most valuable thing you can give to someone. The best presents are food presents, especially home made ones and from now, each year I will set aside the 8-10 hours needed to make bánh tét so that I can give them away to my family for the Lunar New Year. Recipe adapted from Into the Vietnamese Kitchen by Andrea Nguyen. In the book, Andrea Nguyen makes bánh chưng which are the square shaped sticky rice cakes but I made bánh tét which are the cylinder shaped sticky rice cakes. Vietnamese from the North consume the square banh chung cakes, whereas the Central and South Vietnamese prefer the round banh tet cakes. My parents are from the South – Ho Chi Minh City. I also made adjustments to the Andrea Nguyen’s recipe – using different quantities of rice and mung beans, adding shallots and sugar to the pork marinade, and I used pork belly instead of pork leg. Plus raffia string, glad wrap and foil. Wash the long grain glutinous rice in 2-3 rinses of water and soak the rice overnight in a large bowl, add water to cover by 2 inches. Wash the dried yellow mung beans in 2-3 rinses of water and soak the mung beans overnight in a bowl, add water to cover by 1 inch. Drain the soaked mung beans and spread them out evenly on a steamer tray. Steam for about 8 minutes or until the mung beans are tender. Remove the mung beans and let them cool. When the mung beans are cool, process them in a food processor until it is ground and resembles fine cornmeal but it will hold together when you pinch it between your fingers. Drain the long grain glutinous rice in a colander and then return to the bowl, and sprinkle all over 1 ½ tablespoons of salt and mix in well. Put the pork belly strips in a bowl and add 1 finely chopped shallot, 3 tablespoons of fish sauce, 2 ½ teaspoons of freshly ground black pepper and ½ tablespoon of brown sugar and mix well. Marinate in the fridge for 1 hour. Then cook the pork by heating some oil in a frying pan over medium high heat and add the pork into the pan in a single layer with all the marinade. Cook, turning once, for about 2 minutes each side, or until the pork is just cooked through. Note: Wrapping the bánh tét is tricky and I watched a few You Tube videos to get the technique – check out this and this (btw the videos are in Vietnamese but a good reference to visualise the wrapping process). Here is a rough guide where I attempt to explain how I made the bánh tét packages - more useful to watch the videos. 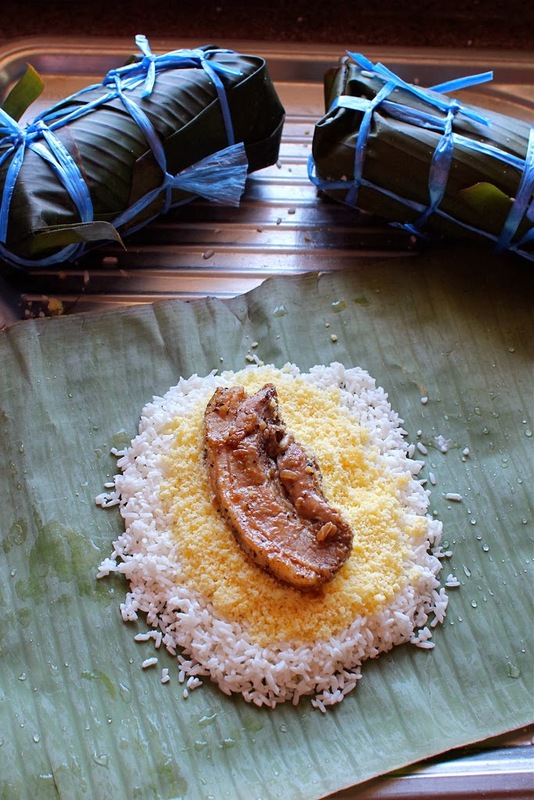 On a piece of banana leaf, spread some of the rice on it to form a rectangle about 3-4 inches wide and 6 inches long (amount of rice added depends on size of banana leaf, leaving a gap for the top and bottom). Spread some ground mung beans on top of the rice, then add piece(s) of pork on top. Cover the pork with more ground mung beans and rice. Roll up the banana leaf with the filling into a cylinder shape and use string to tie up the roll at intervals. 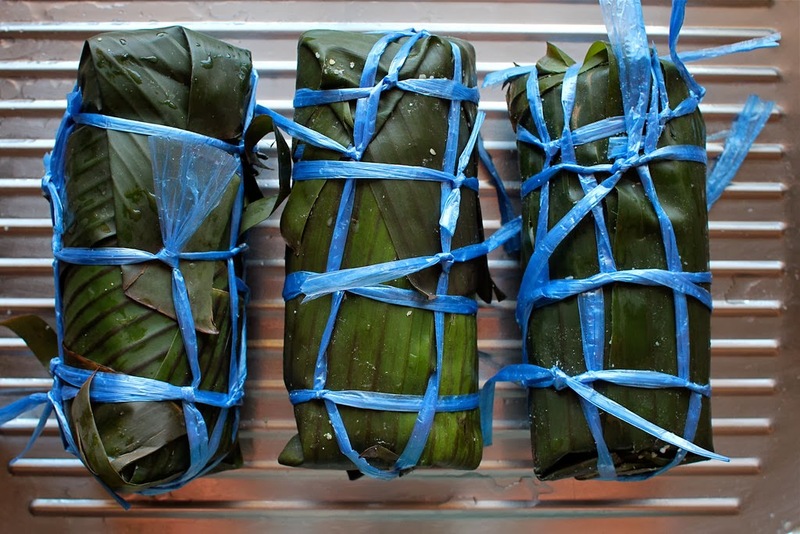 Then stand on one end to add a little bit of rice (make sure the filling is packed in) and fold over the banana leaf (it’s like wrapping a present! 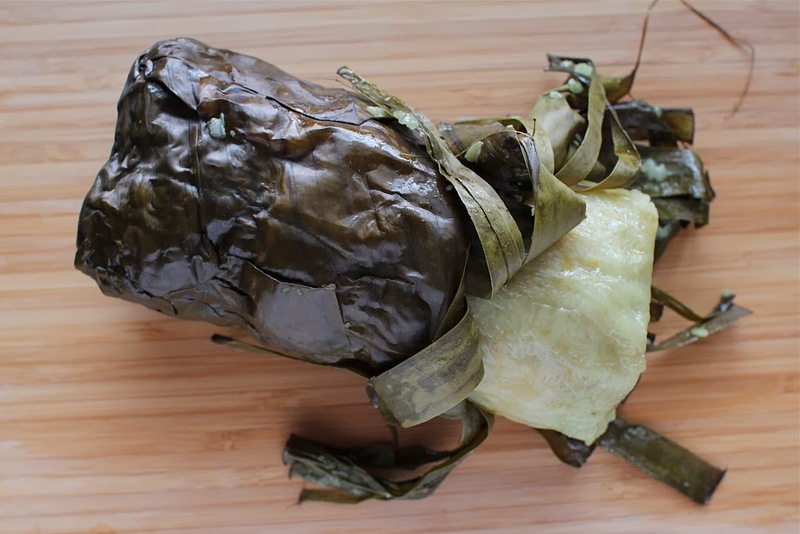 ), turn over and stand on the other end, add a little bit of rice and fold over the banana leaf. Use string to tie up the cylinder and seal the ends. You want to make the package to be secure and tight but don’t tie it too tightly as the rice expands during cooking. Note: I found that the banana leaves can split when you are rolling and wrapping up the package, so have extra pieces on hand and use to patch, double up the ends and tie with string. To make it water tight, I then wrapped the rolled sticky rice cake package in glad wrap and then a piece of foil and tied it up. Repeat. I made 4 rolls of bang chung about 16-17cm long and 6-7cm wide. Fill a large stockpot ~2/3 full of water and bring to boil. Add the packages and to keep them from floating, weight it down with an empty saucepan on top. Cook uncovered for 6-7 hours. Keep the water at a gentle boil/simmer. 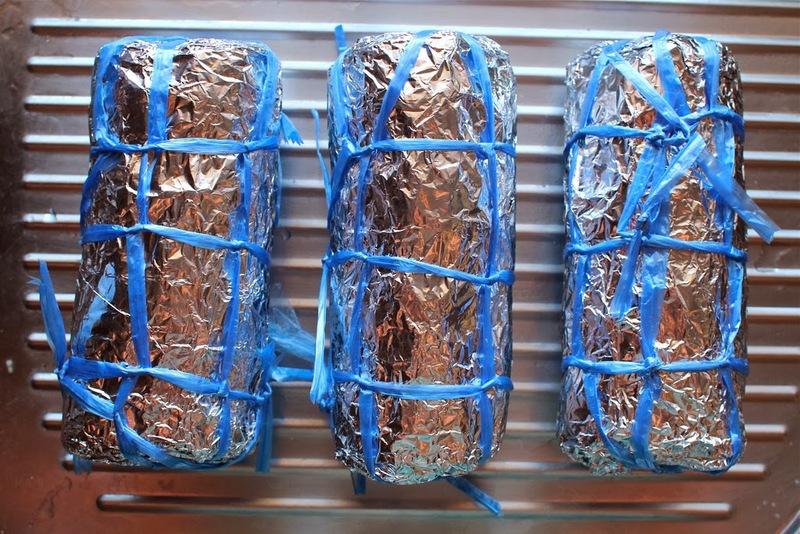 As the packages cook they will expand and gain weight, and at about 3-4 hours of cooking time, they will no longer float so you can remove the saucepan as a weight. Keep a kettle/saucepan of boiling water on the stove to replenish the water in the pot as needed to keep the packages submerged in water. Every hour or two, rotate the packages around so that they will cook evenly. after 7 hours of boiling the foil has gone black! After the packages have finished cooking, use tongs to transfer packages to a tray/plate to cool. I left it to cool overnight. Then next day I removed the foil and glad wrap. I peeled off the banana leaves and sliced the bang chung into ~1cm rounds and fried them in a frying pan with a bit of vegetable oil for a few minutes on each side until the rice had softened and the outside is crispy and golden. 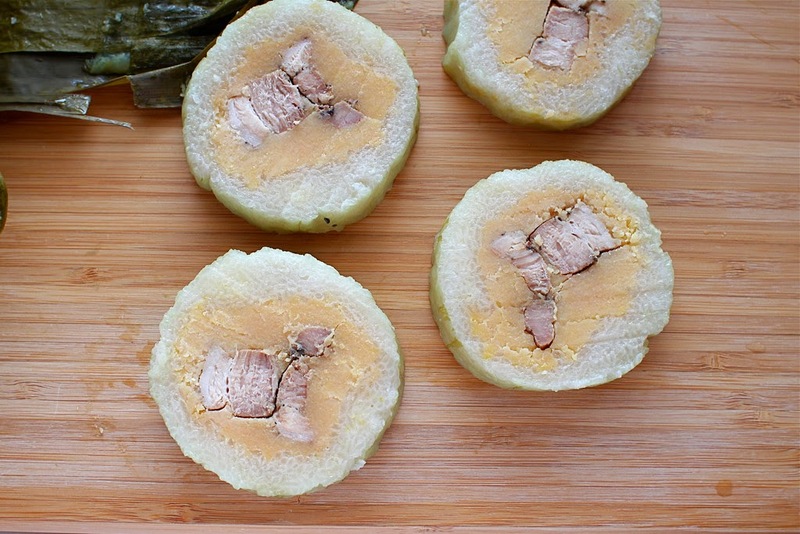 You can also eat the bánh tét at room temperate or warmed by steaming or microwaving. Holy cow.. 8-10 hours to cook? Now that's dedication. :) My daughter-in-law is Chinese and she goes all out for New Year. Probably to give her American children a bit of her heritage. I don't think she cooks anything that takes all day to cook. I'll ask. This does look good!